The IC-7700 is fitted with BNC RX ANT OUT and RX ANT IN sockets allowing connection of an external preselector, preamplifier etc. These sockets are bypassed by default, but may be activated via menu option (Ref.1, p. 10-5). Fig. 2 shows the signal paths involved. Fig.2: IC-7700 RX ANT switching. Fig. 1 is a simplified block diagram showing the interconnections between the IC-7700 and the IC-756Pro3. The hybrid splitter (SPLTR) allows the same antenna to feed two receivers, whether in the same band or in separate bands. The splitter is a transformer hybrid, which is a broadband passive device. Its nominal insertion loss is 3 dB, and its trans-hybrid loss (output port isolation) is typically 20 to 30 dB. In this application, the splitter should be flat over a 1 - 50 MHz range or better. The splitter input port (IN) is connected to IC-7700 RX ANT OUT*. One output port (OUT1) is connected to IC-7700 RX ANT IN, and the other (OUT2) to the normally-closed (NC) contact of relay RL1. The common contact of RL1 is connected to the XVERT (transverter) RCA jack of the IC-756Pro3, and the normally-open contact to a 1W 50Ω termination. * CAUTION! To avoid applying IC-756Pro3 transverter drive power to the IC-7700 front end, do not reverse the IC-7700 RX ANT IN and RX ANT OUT jumpers. The coil of RL1 can be powered from the 15V accessory power socket of the IC-7700 as shown, or from ACC(2) Pin 7 on the IC-756Pro3. The other end of the coil is connected to the IC-756Pro3 SEND RCA jack. A snubbing diode should be connected across the coil with the cathode (band) towards the power source. Mini-Circuits offers a broad line of splitters and combiners. (Examples: ZSC-2-2 , ZFSC-2-6 and ZSC-2-1W .) If desired, the splitter, relay RL1 and the termination can be built into a die-cast shielded box, with RF and DC connections brought out to BNC sockets and 0.01 µF feed-through capacitors respectively. The secondary receiver must be muted and protected whilst transmitting on the primary transceiver. As the IC-756Pro3 does not have a muting input as such, we are resorting to a "trick" to mute the IC-756Pro3 and protect its front end. The IC-756Pro3 is placed in the Transverter mode by connecting a 27 kΩ 0.25W resistor between Pins 6 and 7 of its ACC(2) socket. This activates the bi-directional XVERT RCA jack for receive and transmit. The IC-756Pro3 can be keyed from the IC-7700 by connecting Pin 3 of its ACC(2) socket to the IC-7700 RELAY RCA jack. Refer to Table 1. Table 1: IC-756Pro3 ACC(2) Connections. On receive, the signal from the antenna is divided equally between the IC-7700 and IC-756Pro3 front ends - the latter via RL1 (non-operated). On transmit, the IC-756Pro3 transverter drive signal (- 2 dBm max.) is routed via RL1 (operated) to the termination. As the IC-7700 is also transmitting, this signal will not interfere with it. Refer to Fig.1. 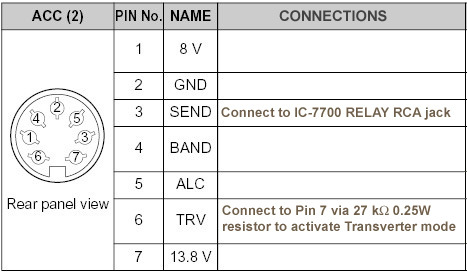 In the proposed basic configuration, the IC-7700 is keyed in the normal manner - either from Pin 5 of the MIC socket or from Pin 3 of ACC(1) or ACC(2). In turn, the IC-7700 keys the IC-756Pro3 from its RELAY RCA jack. SEND Relay Type should be set to Lead (Ref. 1, p. 12-8). The delay between IC-7700 and IC-756Pro3 keying should be sufficient to ensure that the IC-7700 receiver front end is isolated before the IC-756Pro3 transmits. With XVRT active on the IC-756Pro3, the maximum RF output at the transverter jack is -2 dBm. If the T/R relay in the IC-7700 operates before RL1, the IC-7700 RX ANT OUT port will be open. Looking at the splitter, if a signal at 2 dBm is applied to OUT2 from the IC-756Pro3 XVERT jack, the signal delivered to IN will be at -5 dBm. If the splitter has 20 dB trans-hybrid loss, the maximum power at OUT1 will be -25 dBm. In the worst case, this signal will be applied to the IC-7700 RX IN for a very short interval until RL1 switches. Before applying full RF power to the system, a simple timing test should be performed with an oscilloscope. If the IC-756Pro3 is keyed too early, and sends a short burst of RF energy to the IC-7700 front end, an RC circuit can be used to delay T/R switching of the IC-756Pro3 until RL1 has operated. This can be an external circuit which keys each radio's ACC (2) Pin 3 (SEND) line in the correct sequence, with a common master keying input line (as opposed to keying the IC-756Pro3 from the IC-7700, as shown in Table 1.) The time constants can be adjusted to ensure that the IC-756Pro3 has switched to transmit by the time the IC-7700 starts transmitting, but cannot apply its RF output across the splitter to the IC-7700 receiver input. It is recommended that 20 dB pads be placed at the IC-7700 RX IN and IC-756Pro3 XVERT jacks during the timing test. If the IC-756Pro3 is operated only in SSB and CW modes with no key or mic connected, it will not deliver any RF power even in transmit. This will also confer some protection. If the IC-756Pro3 is used only as a receiver, there will be no need to connect a key or mic to it. When the IC-756Pro3 is placed in the transverter mode, the Preamp and RF Attenuator (ATT) functions are disabled. Although this may pose a disadvantage under some operating conditions, the transverter configuration is "fail-safe". It is impossible to mis-configure the Pro3 in a manner that can cause damage, as long as the transverter plug (incorporating the 27 kΩ resistor between Pins 6 and 7) remains in the ACC(2) socket. It is also possible to multicouple an SDR (Software-Defined Radio) receiver such as the PERSEUS to the IC-7700. 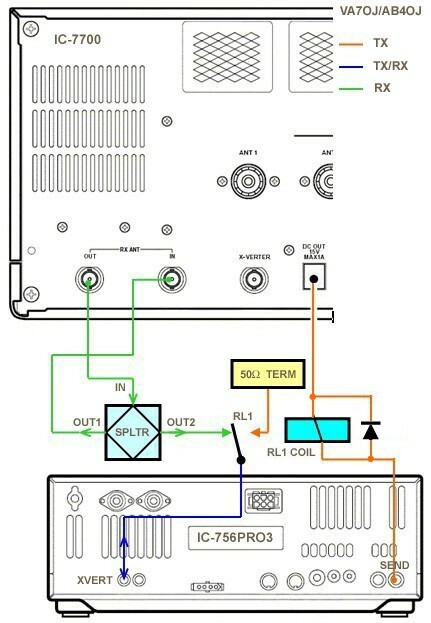 As the Perseus is not fitted with a muting line, RL1 should be SPDT with the second contact set breaking the audio signal path to the speaker or otherwise inhibiting the SDR audio output. I would like to thank my good friend Matt Erickson KK5DR for his helpful contributions on EMC and T/R timing. Copyright © 2007, A. Farson VA7OJ/AB4OJ. Images courtesy Icom Inc.